For more than two centuries, the Assyrian army advanced across Southwest Asia. it overwhelmed foes with its military strength. after the Assyrians seized control over Egypt, the Assyrian king Esarhaddon proclaimed that he was the one who destroyed the kush. the las Kushite pharaoh retreated to Napata, Kush's capital city. Begging around 850 B.C., Assyria acquired a large empire. The Assyrians came from the northern part of Mesopotamia. Their flat, exposed land made them easy for other people to attack. Invaders frequently swept down into Assyria form the nearby mountains. many suppose that the Assyrians developed their warlike behavior from all the invasion they suffered. Through constant warfare, Assyrian kings eventually built an empire that stretched from east and north of the Tigris River all the way to central Egypt. Assyria was a society that glorified military strength. Its soldiers were well equipped for conquering an empire. Making the use of iron working technology of the time, the soldiers covered themselves in stiff leather and metal armor. Advance planning and technical skilled allowed the Assyrians to lay siege to many enemy cities. When deep water blocked there passage, engineers would span the rivers with pontoons, or floating structure used to support a bridge. Before attacking, the Assyrians dug beneath the city’s walls to weaken them. Then, with disciplined organization, foot soldiers marched shoulder to shoulder. The Assyrians conquered and ruled lands that extended far beyond the Fertile Crescent into Anatolia and Egypt. During 850 and 650 B.C., the Assyrian kings defeated and took over Syria, Palestine , and Babylonia. By the end of 650 B.C., the Assyrians had taken over and were currently controlling most of the civilizations of Southwest Asia. These provinces, which were later made into independent territories, were conquered by Assyrian officials, and kings whom controlled the dependent and chose who ruled these regions. this system of having local governors report to a central authority became the fundamental model of administration. Military campaigns, on the other hand, were adding new territories to the empire as well. This addition brought taxes and tribute to the treasury of the Assyrian empire. The Assyrians still had not left their cruelty behind. If a citizen did not want to pay taxes, the Assyrian military were ordered to go into that city, destroy it, and send the person into exile, which brought the Assyrian empire more fear towards other neighboring cities as well as effectively governing the empire. The Assyrian culture is composed of some of the greatest warriors that with the course of time, they had been earning fame. One of them is the King Sennacherib who burned Babylon and established Assyria's capital at Nineveh along the Tigris River. Back then, when this city was built, it was known as the largest city. Now in days, Assyrian have a celebration called the Assyrian Feast, which is a three-days celebration that is composed of Church of the East, the Chaldean Catholic Church, the Syriac Orthodox Church, and the Syriac Catholic Church (as well as The Malankara Orthodox Syrian Church and Syro-Malankara Catholic Church in India). Nineveh held one of the ancient world's largest libraries. The King Ashurbanipal collected more than 20,000 clay tablets throughout the Fertile Crescent. The Library of Ashurbanipal is a collection of clay tablets recovered by Austen Henry Layard in the mid-19th century at the Mesopotamian city of Nineveh. The library included 25,000 clay tablet fragments adding up to about 1200 texts written in cuneiform. The texts cover information on all kinds of things— including religion, bureaucracy, science, mathematics, poetry, medicine. The tablets were written during the Assyrian king Ashurbanipal's reign between about 668-627 BC. 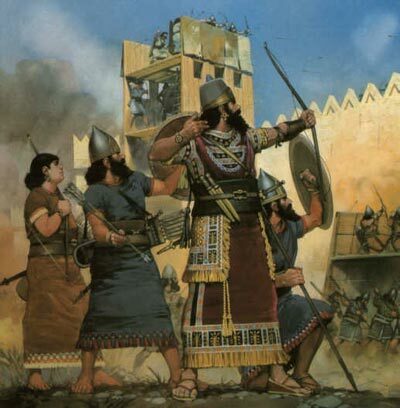 While the Assyrian archers launched waves of arrows against their opponents defending their city walls, Assyrian troops three their ladders up against the walls and began their climb into their enemy's turf. Assyrian troops were equipped with the best weapons at the time, iron swords, iron daggers, and pointed iron-pointed spears. They wore copper or iron helmets, padded loincloths, and leather skirts layered with metal scales. The Assyrians were barbaric in the way they defeated their enemies. Those who weren't massacred in the initial attack were often impaled or beheaded. Women and children were sometimes murdered or enslaved. To prevent their enemies from rebelling against them the Assyrians forced them to live far away in the empire's distant provinces and dependent states. Assyrian troops dug beneath the city walls to weaken the foundation. While the archers launch their arrows, another group of troops hammer the cities gates with massive, iron-tipped battering rams until the gates splintered. 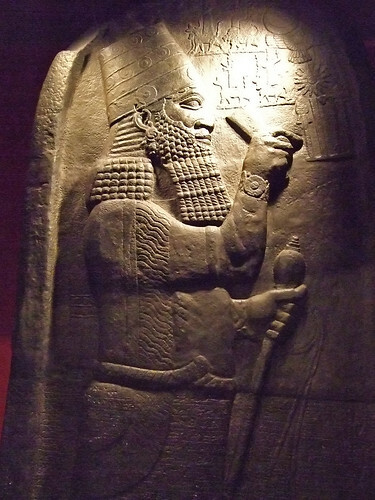 The last great and mighty Assyrian ruler was Ashurbanipal (669-626). Assyrian power had spread itself too thin. He conquered Egypt, the eastern Minor Asia and most part of the Arabic peninsula. A combined force of Medes, Chaldeans, Scythians, and Babylonian siege Nineveh, the capital of Assyria, and the city fell within three months. The cruelty of the Assyrians had caused them to gain many enemies. The fall of Nineveh in 612, marked the end of the famous Assyrian Empire. Famous for their cruelty and fighting prowess, the Assyrians were also monumental builders, as shown by archaeological sites at Nineveh, Ashur, and Nimrud. After defeating the Assyrians, the Chaldeans made Babylon their capital. Around 600 b.c., Babylon became the center of a new empire, more than 1,000 years after Hammyrabi had ruled there. A Chaldean king named Nebuchadnezzar restored the city. During the reign of Sennacherib of Assyria, Babylonia was in a constant state of revolt, led by Mushezib-Marduk, and suppressed only by the complete destruction of the city of Babylon. In 689 BCE, its walls, temples and palaces were razed, and the rubble was thrown into the Arakhtu, the sea bordering the earlier Babylon on the south. This act shocked the religious conscience of Mesopotamia; the subsequent murder of Sennacherib was held to be in expiation of it, and his successor Esarhaddon hastened to rebuild the old city, to receive there his crown, and make it his residence during part of the year. On his death, Babylonia was left to be governed by his elder son Shamash-shum-ukin, who eventually headed a revolt in 652 B.C. against his brother in Nineveh, Assurbanipal. The city of Rome is not the Babylon of prophecy. Rome has wrongly been associated with Babylon because of an erroneous identification of Daniel’s fourth beast with the Roman Empire. The Book of Daniel contains very little information about the Roman Empire as many theologians and historians in the top universities know. The fourth beast of Daniel is clearly shown to be an extension of the Greek Empire of Alexander the Great. It is particularly identified with the Seleucid Empire which existed from 312 to 165 B.C.E. Those who claim that the Babylon of prophecy represents Rome make a fundamental mistake in interpretation. There is not any evidence in the Book of Daniel which will remotely substantiate their claim. Many people feel the prophecies about Babylon in Isaiah 13 and Jeremiah 50–51 pertain only to the ancient city. However, not one of those prophecies was fulfilled in the 6th century B.C.E. when the empire of Babylon handed over power to the Medes and Persians. These prophecies will happen at the end of our age. There must be a new, rebuilt Babylon on the Euphrates in order for God to bring those prophecies to pass. There is much proof to demonstrate this fact. Notice the second chapter of Daniel. The dream of Nebuchadnezzar recorded in Daniel 2 should be reviewed carefully. When Daniel interpreted the dream for the king, he recounted the image whose "head was of fine gold, his breast and his arms of silver, his belly and his thighs of brass, and his legs of iron, but his feet part of iron and part clay" (verses 32–33). Daniel further told the king that he witnessed a stone cut from the top of a mountain, which rolled down its slope hitting the image on its ten toes—on the base of the image. It "brake them [the ten toes] to pieces" (verse 34). But not only that, the stone went on to accomplish something else. "Then was the iron, the clay, the brass, the silver, and the gold, broken to pieces TOGETHER, and became like the chaff of the summer threshingfloors; and the wind carried them away, that no place was found for them: and the stone that smote the image became a great mountain [the Kingdom of God], and filled the whole earth." Notice a significant point overlooked by so many. Daniel said that the parts of the image (from the gold down to the iron and clay) were all destroyed TOGETHER. This needs to be emphasized! Daniel said that Nebuchadnezzar, king of Babylon, represented the head of gold, and another kingdom (silver) would arise after Babylon, followed by a third kingdom (brass), then a fourth (iron), and finally there would be a fifth kingdom of iron and miry clay (the ten toes). Yet Daniel said all these kingdoms would be destroyed at the same time. How could this be if ancient Babylon was destroyed in 539 B.C.E., Persia in 330 B.C.E., Greece in 323 B.C.E., and Daniel’s fourth empire of the Seleucid’s in 165 B.C.E.? Still, Daniel told Nebuchadnezzar that all the kingdoms would be destroyed together as anyone can plainly read in the Bible. "It [the stone] shall break in pieces and consume ALL THESE KINGDOMS [represented by the composite image], and it shall stand forever" (verse 44). How can the stone destroy the empires of Babylon, Medo-Persia, Greece, and that of the Seleucid’s, if all of them were successively destroyed and obliterated centuries ago? This factor has always been a problem with prophetic commentators over the years, but it need not be if one will simply believe all the teachings of Scripture.